The Busy Buddy Waggle is an all-natural rubber toy that you can shake and wag to their hearts content. Made with a super flexible middle that bends and waggles in a fun way for your dog to enjoy, the toy can also have dry food or treats pushed into the ends which will then be dispensed randomly to give your dog hours of fun. This has to be the most successful toy for a Staffy I've ever owned. Few toys last longer than a day or two (more often an hour or less) but she has been playing with this daily since March and its still in one piece. Yes, its starting to show sign of wear from repeated shaking and tugs of war but six months is an absolute record. Brilliant product. 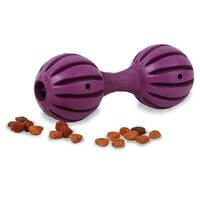 Surprisingly, my Jack Russell doesn't chew the soft but durable rubber of the Busy Buddy Waggle - instead he loves to toss it about to release the treats I stuff either side with, and carry it almost everywhere with him from the flexible centre. Brilliant product for a bargain price! This is a great toy at a great price. My dog loves it and it keeps him occupied while I am at work. It's very durable- after several months of use it barely has a mark on it which is more than can be said for most of his toys! My girls love this so much I needed to buy them one each.